Simple to do - no drama experience needed! Everyone knows the myth of Pandora: she opened up a box and released a ton of evils into the world. What was her motivation? Now we know: her feet were cold, and she was just looking for some socks! While she hunts for something to warm her feet, Pandora meets favorite characters from Greek mythology—including Midas, Icarus, Narcissus, Heracles, Prometheus, and the gods! 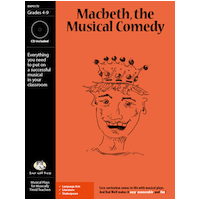 Please scroll down to read the script, read reviews, and get all the details about the play (curriculum/content, educational standards, and vocabulary). 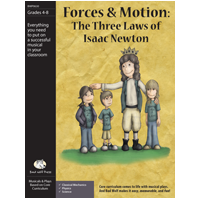 Order 1 copy of play for each teacher/director who will be using it. Includes permission to print/photocopy for all participating actors. Mix and match 2 or more non-musicals to get them for $30 each. 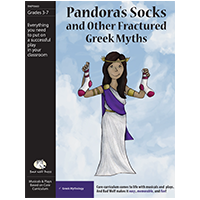 Pandora's Socks and Other Fractured Greek Myths is a great complement to your curriculum resources in language arts. 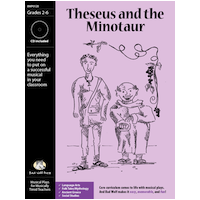 And, like all of our plays, this show can be used to improve reading, vocabulary, reading comprehension, performance skills, class camaraderie and teamwork, and numerous social skills (read about it!) -- all while enabling students to be part of a truly fun and creative experience they will never forget! Flexible casting: There are 28 parts, but the play can work with anywhere from 11-35 actors. For a smaller cast, each actor can play several roles and/or individual scenes can be cut. For a larger cast, larger roles (such as Pandora) can be split amongst multiple actors. An easy way to add more characters is to add more Muses (we've used three, but there are nine total) or have different actors play the Muses during their reappearance in scene 8. Note that all roles can be played by either boys or girls. PROMETHEUS (entering, shouts): Epimetheus! Where are you? Epimetheus, get over here! EPIMETHEUS (entering): Stop shouting. What is it, Prometheus? PROMETHEUS: Did I see you with a woman? EPIMETHEUS (reluctant, looks down): Maybe. PROMETHEUS: I knew it! Where'd she come from? EPIMETHEUS: Umm. I don't know. PROMETHEUS: Don't mess with me. This is serious. EPIMETHEUS (shrugs): I found her. PROMETHEUS: You found her? Where? EPIMETHEUS: In a box of cereal. Yeah, that's it. Cereal. PROMETHEUS: You did not! Tell me truth. Did Zeus give her to you? PROMETHEUS: DID ZEUS GIVE HER TO YOU? PROMETHEUS (exasperated): Epimetheus! We've gone over this a million times. What's rule number one? EPIMETHEUS: Uh...Don't bring a giant wooden horse into the city? EPIMETHEUS: Hmm...Watch where you step after a herd of centaurs goes by? EPIMETHEUS: How am I supposed to remember?! You've got so many rules! PROMETHEUS: Rule number 1! It's the most important of them all! Never, ever, EVER, EVER accept a gift from Zeus. EPIMETHEUS: Why not? He's the king of all the gods! PROMETHEUS: Because Zeus HATES me, that's why! You know the story. Everyone knows the story. TERPSICHORE (points to audience): Yeah, I can see their faces. They're LOST. CLIO: Well, that's why we're here! Who better to tell them the story than us Muses? CALLIOPE: Exactly. Storytelling is our BAG, baby! TERPSICHORE: Here goes. Zeus wouldn't give fire to humans. They had no light at night. No warmth in the cold. No cooking. CLIO (to EPIMETHEUS): No, dear. And no s'mores. So Prometheus stole fire from Olympus and gave it to humans. Zeus swore he would get even with Prometheus and make life hard for humans. PROMETHEUS: Exactly. Thank you, Muses. And so I've told everyone, including my dolt of a brother here, not to take anything from Zeus because it's likely to be a trap. 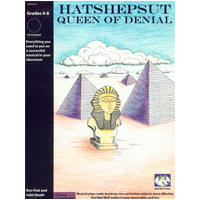 CALLIOPE (to EPIMETHEUS): Where's the woman now? EPIMETHEUS: How should I know? She was all upset and left. EPIMETHEUS: Her shoes, or feet, or something. I wasn't really paying attention. PROMETHEUS: Come on, we have to find her. EPIMETHEUS: Don't worry, she can't have gone too far. EPIMETHEUS: 'Cause she was carrying this big thing around. PROMETHEUS (stopping; worried): What kind of thing? EPIMETHEUS: I don't know. Maybe a box? HERA: Zeus, what have you done? I recognize that smug little smile of yours. You're up to something. ZEUS: Oh Hera, you're always so suspicious. HERA: Maybe it's because a lot of your thunderbolts have "accidentally" landed in my bathtub. ZEUS (to HEBE): Your mother has no sense of humor. My goodness, what are you wearing? And is that a tattoo? HEBE (defiantly): I'm sick of being so youthful. I want to grow up! HERA: Don't be ridiculous. Your name means "youth." You'll be a preteen forever. HEBE: It's not fair! I want to wear grown-up clothes and bicker with my husband just like you! HERA: Oh sure, that sounds good. But give it a couple thousand years. The glow wears off. ZEUS (waving at them): Ssshhh. Wait for it. Any second now. HERA: What are you talking about? You DID do something, didn't you? HEBE: What did you do, Daddy? ZEUS: I had Hephaestus create a woman and I sent her down to Epimetheus. I gave her a jar with all sorts of nasty things in it. I just KNEW she'd open it. HEBE: What kind of nasty things? ZEUS: You know, evil stuff, like disease and miseries and subprime loans. Once they're out of the jar, humans can't ever put them back in. That'll teach them for using my divine fire! HERA: You really need to get a hobby. HERACLES: Hey guys, you won't believe what just happened! HERA: What's with the three-headed dog? HERACLES: This is Cerberus. I had to fetch him from Hades. Hey, get away from there! Sorry, Mom. He's not house-trained yet. You should see my apartment. HERA: Heracles, it's time you knew the truth. I am NOT your mother. HERACLES: Of course you are! ZEUS: No, she's right. You were born to a mortal woman. HERACLES: But I've seen the movie! HERACLES (falling to his knees, raising hands to the skies): But if I can't trust Disney, who CAN I trust? Oh well. (brightens) Hey Hebe, you wanna go clubbing? HEBE: You mean, like, dancing? HEBE (giggles): I'd LOVE to! And then let's get matching tattoos! PYGMALION: Please, Midas. Just one little touch. PYGMALION: Come on, man! You can turn something small into gold. How 'bout an apple? MIDAS: No way. I've had it with this golden touch thing. PYGMALION: What about a walnut? Or a grape. Just one little golden grape. MIDAS: Look, Pygmalion, I'm doing you a favor. This has been a disaster. Everything I touch turns to gold. Everything. I've got golden doors. Golden drapes. Golden pants. Have you ever worn golden pants? MIDAS: And heavy. They keep falling down. I'm a king, for goodness sake. It's humiliating. This whole golden touch is more of a curse than a blessing. I wish I'd never asked the gods for it. PYGMALION: But your wife must like the bling. MIDAS: My wife? I kissed her the other day. Now she's gold. The kids are gold. The DOG is gold. PYGMALION: Come on, one last magic touch for your old friend Pygmalion! MIDAS: What do you want a golden grape for? PYGMALION: I need the cash. PYGMALION: My next sculpture. I need a perfect piece of Parian marble so I can make a statue of the perfect woman. PYGMALION: Yes! And then I'm going to dress it up and give it presents and pray to the gods to make it come alive and be my wife! MIDAS (pause, looks at PYGMALION, then): You're a sick man. You need to get some help. PYGMALION: Oh, come on, please? PANDORA: This is terrible, just terrible! MIDAS: Hey, wait, I recognize you. You're Pandora. You're that woman who opened the jar! PANDORA: You know, that's a very judgy tone. There's a lot more to me than that one little mishap. PYGMALION: Mishap? You let all the evils into the world. PANDORA (defensive): Some GOOD things came out of this jar too, for your information. PYGMALION: They hardly make up for disease and death. PANDORA (waving him off): Whatever. I prefer to see the jar as half-full rather than half-empty. MIDAS: Why'd you open the lid in the first place? PANDORA: I was looking for my socks. PYGMALION: Socks? You brought evils into the world looking for socks? PANDORA: When Hephaestus created me, he forgot to give me socks. I figured they were in the jar. I mean, why else would I have a jar? MIDAS: Maybe to contain death and disease? PANDORA: Oh sure, that's easy to say NOW. Can we move past that? These shoes are giving me blisters. It's terrible. I need to find some socks. PYGMALION: Hey, I bet Arachne could weave you some socks. MIDAS: Sure! She's brilliant. Wove me a beautiful wool sweater. 'Course it's a gold sweater now. PANDORA: Arachne? Where does she live? PYGMALION: Across the sea. In Athens. MIDAS (to PYGMALION): Okay, Pygmalion. One last golden grape for you. Then I quit. MIDAS: You probably shouldn't have shaken my hand. PYGMALION (pause): Oh yeah. Right. Drat. This concludes the first one-third of the script. I did it with my summer school kids (40 of 'em.) Every student that wanted a part, got at least one. We split up the Pandora's.... 2 of 'em... the 'bigs' were in charge of costumes and scenery... and they had parts. The kids had more fun than any of them want to own up to. Even the "big" kids got into it. The little kids just loved performing and the parents loved it. I really loved "Pandora's Socks." We just produced it last Monday and the parents raved. It was the perfect length and perfect amount of humor and interest. I cannot do musicals so these (non-musical) plays are amazing. immortal centerpiece mistranslate blasé "put out to pasture"